Having a pressure cooker has really taken the pressure off me (pun totally intended) at dinner time. If I forget to thaw meat for dinner or want a super delicious and quick meal, it’s there for me. One of my favorite things to toss in the pressure cooker is chicken breasts -even better if they are crammed full of all kinds of tasty goodies. 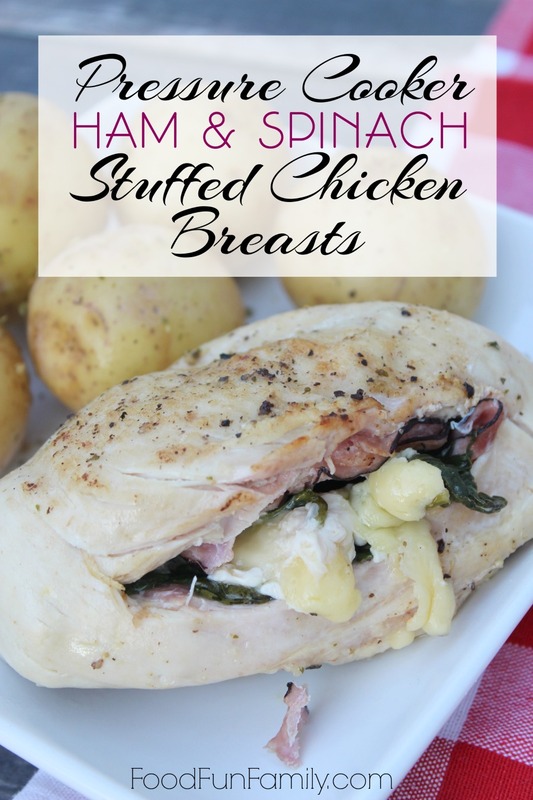 Ham & Spinach Stuffed Chicken Breasts are right at the top of my list! Slice a pocket in your chicken breast along one side; be careful not to cut all the way through. 2. Cut a thick chunk of white cheddar cheese; place inside 2 pieces of ham and stuff into chicken. 3. Grab a handful of washed fresh spinach and stuff it in there too; use this to help your cheese stay inside. Season outside of chicken breast well with salt, pepper, and garlic salt or powder. Use your pressure cooker’s brown feature to brown both sides of chicken breast in a small amount of olive oil. Then place chicken on top of the trivet of your cooker over 1 1/2 cups water. Cook on high pressure for 8 minutes; release pressure naturally and keep the chicken in the pot for 8 additional minutes. Remove and serve with your favorite side for a tasty meal! Cut a thick chunk of white cheddar cheese; place between 2 pieces of ham and stuff into chicken. Grab a handful of fresh spinach and stuff it in there too; use this to help your cheese stay inside. Season outside of chicken breast well with salt, pepper, and garlic salt or powder. Use your pressure cooker's brown feature to brown both sides of chicken breast in a small amount of olive oil. Then place chicken in the trivet of your cooker over 1 1/2 cups water. This looks so good! I’m new to the Instant Pot so I have a dumb question: when you say “release pressure naturally and keep the chicken in the pot for 8 additional minutes”, does that mean 8 additional minutes AFTER the NPR has completed, e.g., after the pin drops wait another 8 mins to open the pot? Or do you mean to do NPR for 8 minutes, and then open? Let me check with Jody. My guess is to wait 8 minutes after the initial timer (ie, 8 minutes of NPR) and then use the quick release for any remaining pressure. At least that’s what I would do! I like recipes using a pressure cooker – so fast! Like all of the ingredients so will want to make soon. 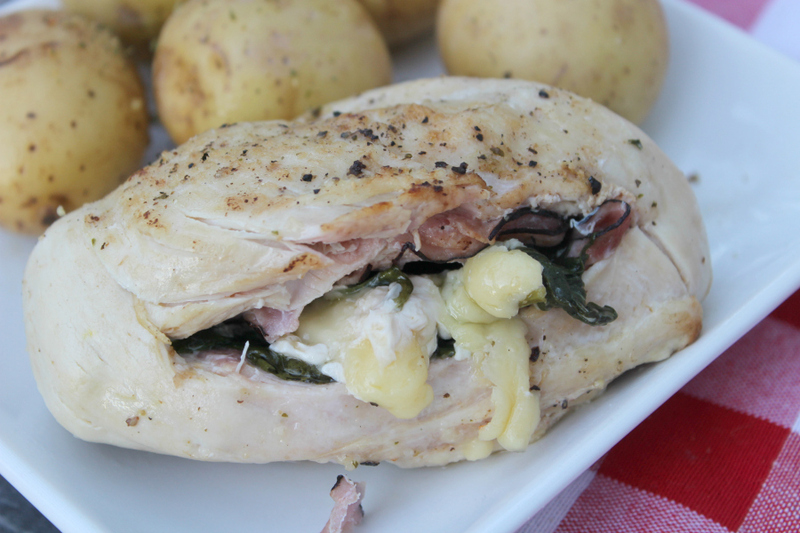 Your Ham & Spinach Stuffed Chicken Breasts looks so delicious and I can not wait to make this for dinner. My family will love it!